Indian women’s recurve team paid the price of inconsistency as it lost the bronze medal match to Chinese Taipei on the concluding day of the second stage Archery World Cup in Antalya on Saturday. Eyeing a third medal from the meet, the Indian trio of Deepika Kumari, Ankita Bhakat and Promila Daimary started poorly before winning the third set but that was not enough as Taipei clinched the contest 6-2 in the fourth set. The Indian team struggled to find the perfect 10s while Taipei brilliantly raised their level in set 4 to produce five 10s out of a possible six to win the match. India thus ended their campaign with a silver and a bronze, courtesy a fine show in the compound section yesterday. 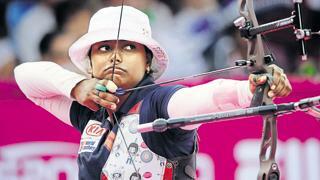 Jyothi Surekha Vennam, Muskan Kirar and Divya Dhayal had won a silver in the women’s compound team category. They were flawless in the entire event but ultimately lost to Chinese Taipei 228-231 in the final match. Jyothi had also bagged a second medal when she partnered with Abhishek Verma to win a bronze medal in the compound mixed pair category.